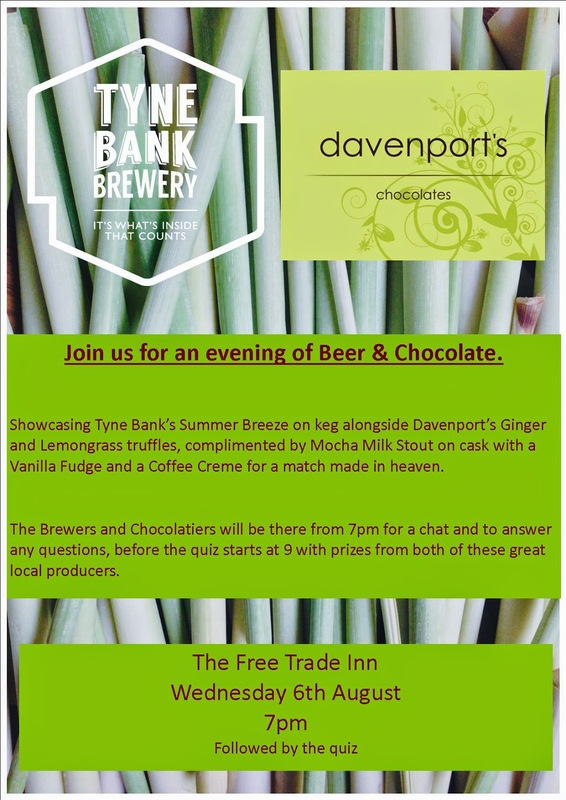 Tyne Bank Brewery: An evening of Beer & Chocolate. An evening of Beer & Chocolate. Join us for an evening of tasty beer and hand crafted chocolates at the Free Trade. To showcase the kegged version of our latest and hugely popular special, Summer Breeze, we are teaming up with Davenport's Chocolates to pair a couple of our beers with a selection of their delicious chocolates. Brewed using ginger and lemongrass, at 3.9% Summer Breeze is the perfect beer for lazy summer evenings, packed full of flavour yet light and refreshing. We have been planning this event since Davenport's suggested our beer would be great paired with their Ginger and Lemongrass truffles, via the local networking hashtag #northeasthour. The response was huge, so we had to make this happen. As a compliment to the summery flavours of Summer Breeze with the Ginger and Lemongrass truffles, you will be able to enjoy our Mocha Milk Stout alongside the luxurious combination of a vanilla fudge and a coffee cream. A packet containing one each of the three chocolates will be available from the bar for only £1.70, and there will be a wide range of Tyne Bank ales on draft for you to enjoy. Tempted? Get yourself down to the Free Trade Inn on Wednesday 6th August from 7pm for these tasty treats. Both ourselves and Davenport's will be there for a chat and to answer any questions you may have about our products. The Free Trade's popular weekly quiz will start at 9pm, with prizes from both ourselves and Davenport's, so you can make an evening of it!